I love the diversity that Bristol’s food scene has to offer. Whatever you want to eat of an evening, you’ll no doubt be able to find it somewhere in the city. Having never had Nigerian food before, a trip to Iroko on Midland Road was a good way to soak up some of this diversity. I visited the restaurant, which is taking part in the current ‘Around The World In 80 Days’ campaign, on a quiet midweek evening – and armed with a dining companion who had already experienced the venue. During the day, she informed me, the place has a very different atmosphere: having felt more like a cafe on her first trip, Iroko has much more of a bar vibe at night. The front door of the venue opens into a small bar area, from which we were shown to the dining room, with a view of the kitchen at one side, a large projector screen showing Champions League football at the other. I love going to places which have menus that are dramatically different from anything that I’ve seen before, and Iroko certainly fits that description. Starters, priced at between £4 and £12, include chicken gizzard, snails and nkwobi, described on the menu as ‘spicy cowfoot’. Mains are almost all under £10, and divided into rice dishes, soups, yam dishes, bean-based dishes and the chef’s specials. A children’s menu is also available, with mains at around the £4 mark. In order that we could try out a variety of dishes from the menu, we were offered a mixed platter to share, accompanied by a side salad each. This proved a great way to sample both the more familiar and the unknown. 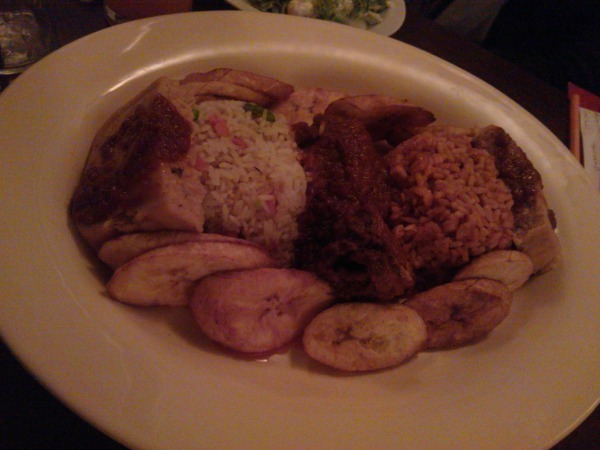 Slices of perfectly cooked plantain adorned the sides of the platter, the majority of which was taken up by two mounds of rice. The fried rice was packed with various vegetables and prawns, while the jollof rice was probably the highlight of the meal for me. Popular throughout West Africa, this dish has a tomato and onion base, and is intensely flavoured with various spices. The added Scotch Bonnet chilli gave it a nice kick – but if you prefer your food milder, you can ask for any dish on the menu to be prepared with less chilli. This was accompanied by the traditional Nigerian suya – a dish of roasted beef (sometimes also made with chicken), normally served in a similar way to a shish kebab. Iroko’s version is served on the bone, and while the spices coating the meat were delicious, the meat itself was sadly a little overdone. The final item on the platter was moin moin – described as a “steamed bean cake served with tomato based sauce”. I can honestly say that it’s unlike anything I’ve ever eaten before. Dense and moist, this soft bean pudding is made from de-skinned and ground beans, combined with dried crayfish and tomatoes. I really don’t know how to describe the flavour – it’s not overpoweringly fishy, but that particular ingredient adds just enough salt to lift what could otherwise be quite a bland dish. The thick tomato sauce was a great accompaniment too. I’ll definitely be ordering this on my next visit! After a slight rice overdose, we decided to leave without having dessert (a choice of ice cream, fruit cocktail, apple pie and ice cream or strawberries and cream, all at around the £3 mark). If you’re not interested in trying Nigerian food but fancy a night out with a difference, keep track of what’s on via their Facebook page: the venue often plays host to local DJs specialising in African music. Iroko is also available for private hire, and will cater for weddings and other events. It’s worth paying Iroko a visit to try something a little different. The food is great value for money – and even more so if you use an “Around The World In 80 Days” campaign voucher. There’s currently a choice of three available, including a tasting platter for two for just £19.99 – click here to see all vouchers. We had a fantastic evening: thanks to the Iroko team for introducing me to new dishes and flavours!